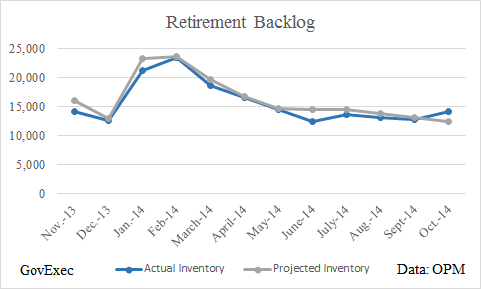 The backlog of federal retirement claims grew by nearly 1,400 in October, reversing steady progress over the summer. But an Office of Personnel Management official emphasized in a statement on the latest numbers that the processing time for applications has improved. 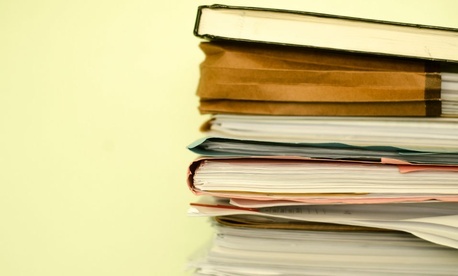 The pile of pending claims stood at 14,137 at the end of the month, according to the new figures from OPM. That’s just 39 claims below where it was last October. An influx in retirement applications is to blame for last month’s backslide. The agency received 10,155 claims in October, which is 2,355 more than officials expected. Retirement claims typically spike in January and then settle to lower levels for the rest of the year. The increase in applications in October was partially due to a buyout at the U.S. Postal Service, according to Ken Zawodny, associate director for retirement services at OPM. The uptick in the backlog comes after months of fairly steady progress since February. The one silver lining in October’s numbers is that the percentage of claims processed in 60 days or less went up, to 83.2 percent. The cases that weren’t processed within that timeframe were more complex, requiring information from parties outside OPM, such as the agency where the applicant worked or the applicant himself, OPM said in a statement accompanying the numbers. OPM faces pressure from Capitol Hill to speed processing, with lawmakers noting in March that an average of 61 days spent on applications was “unacceptable.” The average processing time in October was 35 days, according to OPM’s statement. Officials originally planned to eliminate the retirement backlog entirely by the summer of 2013, but the across-the-board budget cuts from sequestration stymied that effort. Current projections show the backlog growing to 21,642 in January 2015 with the typical start-of-year increase in applications, and then gradually shrinking to 11,042 by September of that year. OPM noted that officials continue to look for ways to improve retirement processing, and have “placed a priority on claims processing, customer service and automation.” The agency has begun a gradual transition to a fully digital process, which will help with speed, the statement said.